2018 Fall Bass Classic Outcome! Outcome of the Fall Bass Classic on Conroe! 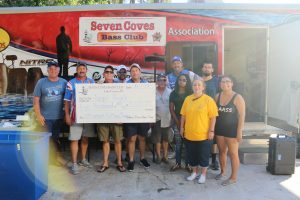 Seven Coves Bass Club celebrated its 11th year of the Fall Bass Classic charity tournament, October 13, 2018, on Lake Conroe. Hosted by StowAway Marina, this year the annual tournament benefited the Kids Unlimited Foundation. Kids Unlimited (kidsunlimited.org) was founded as a 501(c)(3) non-profit organization formed to benefit children stricken with cancer. This organization as founded with the hope to provide children a reprise from cancer and an opportunity to be free of the harsh treatment regimen. Through these efforts, Kids Unlimited joins over 250 families together for consistent family-oriented activities. This year we had 45 angler team entries, which allowed us to pay 6-places, and first and second Big Bass awards. The team of Garrett Pierce and Colin Bode figured it out with their limit of 17.47 pounds. Their win earned them a check of $1500. The team of Sam Granberry and Ron Kost were the winners of the early entry prize drawing sponsored by The BASS Club, winning a Daiwa Fuego reel for each of them. 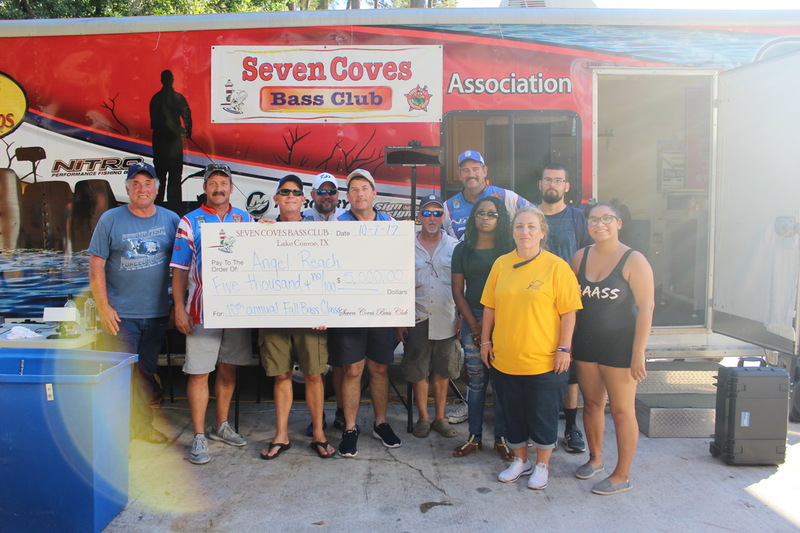 Drum Roll Please – Above all, the biggest winner was the Kids Unlimited Foundation as the 11th Annual Fall Bass Classic was able to raise a record $10,000! We presented this check at the annual Kids Unlimited “Kid Fish” event at Fayette County lake held on October 27, with many kids and families present. The success of this annual event is not possible without our sponsors, anglers, the community, and their support through their participation and donations. We look forward to seeing you in 2019 for another great event! 2017 Fall Bass Classic A Success! Seven Cove Bass Club celebrated our 10th year of the Fall Bass Classic charity tournament. The tournament benefited the local Conroe charity, Angel Reach, for the second year. This year was a little more of a challenge as we all dealt with the effects of Harvey. However we were blessed with many contacting us about fishing the annual event. This year we had 34 angler team entries, which allowed us to pay 7-places, and first and second Big Bass awards. We had eight 5-fish limits weighed in, but the sacks fell off after that with only a 2-fish average per team. The solo “team” of Gabe Alanis figured it out with his limit of 19.95 pounds anchored by a 7.49 kicker, which took 2nd Big Bass for the tournament. Gabe’s win and big bass earned him a total of $1,490. The team of Jason Branham & Jeff LeBlanc were the winners of the early entry prize drawing, winning a Daiwa Fuego rod & reel for each of them. Above all, the biggest winner was Angel Reach as the 10th Annual Fall Bass Classic was able to raise $5,000. This amount includes the $1,000 donation that was presented to Angel Reach by Ron Kost on behalf of the Marine Corps League. A special thank you to David Glezman and the Texas B.A.S.S. Nation for providing use of the state tournament trailer and equipment. More fish attractor construction this past weekend. 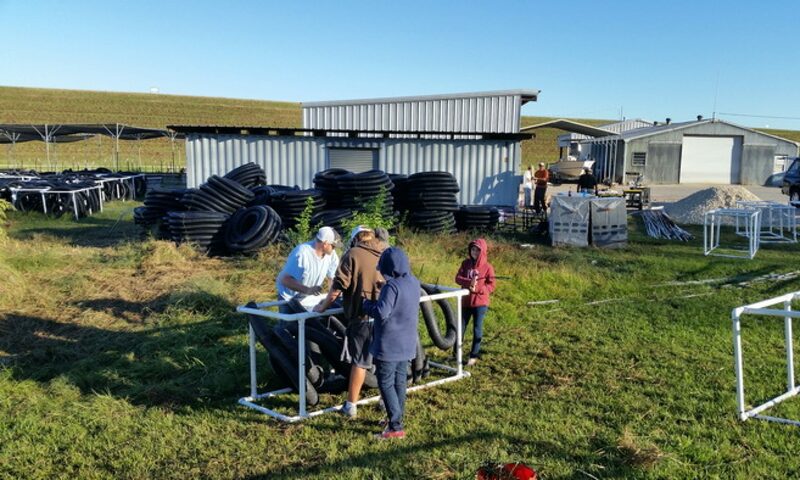 We’ve exhausted our PVC pipe inventory & now we will stuff the frames with the drain tubing on our next build date. Then we should have all the attractors ready for sinking into Lake Conroe with the help of San Jacinto River Authority and Texas Parks and Wildlife Department! I’m unsure if any of these will hit the water before the Bassmaster Classic on Lake Conroe but the long term benefit should be very good! 9th Annual Fall Bass Classic – October 1st! 8th Annual Fall Bass Classic – September 26th!